The strong storm system out west tapping into subtropical moisture will bring strong winds and heavy rains to California over the next couple of days. Cold air behind the system will bring showers and cold temperatures into the weekend. The southwestern desert regions will see a chance of light rain and cooler temperatures as the system passes. Cold temperatures behind the system bring a chance of lettuce ice to the region early next week. High pressure builds next week with a drying pattern expected. Mostly dry and seasonal temperatures across Central Mexico look to continue with a chance of rain in Northern Mexico as the storms pass to the north. A cold front moves through Florida mid-week with light rain across the state a weaker system moves later in the week with scattered showers. Temperatures warm into the weekend with another chance of showers early next week. California and Yuma trucks are both plentiful this week. Washington apple trucks remain steady. Idaho potato and onion trucks remain tighter than normal for this time of year. Colorado trucks are also tighter than normal. The national average on diesel remained steady this week and is still at 2.966 per gallon. 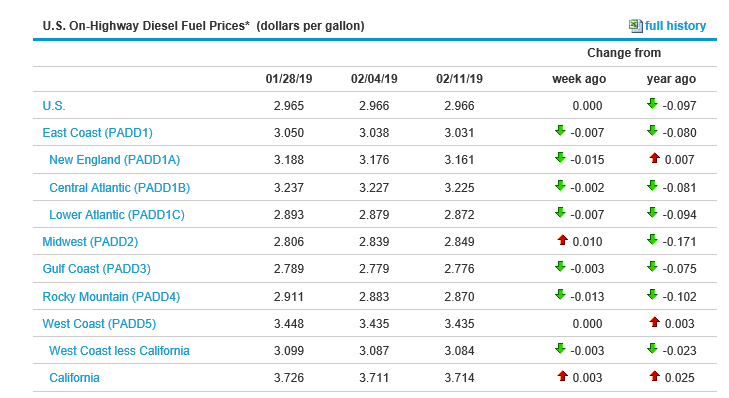 California prices remained steady and are now at 3.714 per gallon. Crude oil prices remained steady and are currently at 53.37 per barrel. Granny Smith and Gold Delicious are peaking on 72/88 with very few 125/138 being packed. Pack-outs are mainly #1 grade. Pricing continues to increase and looks to throughout the balance of the season. Quality is still nice. Fuji and Gala's are peaking on 88 and larger with most pack outs heavy to #1 grade. Red Delicious supplies are good on all sizes peaking on 80/88 with most pack outs heavy to #1 grades. Market has firmed slightly on the smaller sizes. Quality is still very nice. Regional supplies of Red Delicious and Red varietals are still very good. The weather in Caborca remains the same as last week with cold nights and cold afternoons. Overall yields in fields this past weekend were lower than normal due to the weather conditions. Weather conditions in San Luis Rio Colorado (Mexico) are slightly warmer than Caborca and are starting to produce decent volume. Overall markets on both coasts continue to be steady with not much demand as we start to head into the peak of the Mexican season. Currently only maintenance picking, for pruning etc. Suppliers expect to begin marketing California fruit at the end of the month. The industry will begin slowly and advance to 3.5 million lbs. weekly by Mid-March, shipping 7 million lbs. weekly April through July. We are doubtful there will be much fruit left after August. Pricing will depend on Volume/Size curve out of Mexico. California trees have half the volume they had last year due to the fires and heatwave that damaged trees last year. The current rains will allow growers to hold fruit into the summer if pricing on Mexican fruit remains low. The weather this week in Michoacan Mexican is in the upper 70s-80s this week with no rain in the forecast. We continue to see a strong market on smaller fruit (60s and 70s) with good demand and higher prices. Current shipments from Mexico into the US are about the same as last year As we are mid-season into the "Aventajada" crop, fruit cuts great and eats well. Fruit mid to late season has higher dry matter than early season fruit. Avocados that have higher dry matter ripen faster. Bell pepper supplies are finally getting much better. The southeast is enjoying the best stretch of warm sunny weather of the winter and bell pepper yields are increasing. Demand across the whole industry has decreased since the first of February and supplies in both Mexico and Florida have increased bringing the market below the 20.00 mark for the first time in months. Quality is good with most shippers and has been getting better over the last 2 weeks. The forecast is calling for rain later this week with cooler temperatures to follow, but that should only slow harvest for a couple of days before a warm-up comes in time for the weekend. Green Bell Pepper- Good volume on green bell pepper continue to arrive in Nogales. Consistent volume is being harvested from the Sinaloa and Sonora growing region. Quality on green bells from both regions is good. Supplies exceed demand on green bells. Market on Green bells has stabilized after adjusting down on both #1 and choice grade pack. Green bell pepper from Mexico is also available to load in McAllen, TX. Red Bell Pepper- Good volume of Red Bell pepper continue to be available to load in Nogales, AZ from Mexico. The price on the red bell pepper has also stabilized after a slight increased last week. Steady volume continues to be available on both Elongated and Hot House bells in all pack styles. Consistent numbers on both varieties of red bells are expected to continue through the week. Quality of red bell on both varieties are good. Red bell supplies from Mexico currently crossing through Nogales, AZ and McAllen, TX. Yellow Bell Pepper- Moderate volume of Yellow Bell pepper crossing through Nogales this week. Growers transitioning from fields have slowed down production. Both elongated and Hot House varieties being pack in light volume on 11lb/15lb and 1 1/9 bushel carton. Quality on both varieties is good. Demand exceeds supply. Market on the yellow bell has increased this week. Yellow Hot House bells are also available to load in McAllen, TX. Blackberries are experiencing a brief period of shorter supplies due to weather in Mexico affecting crops not grown under hoops. A good percentage of the blackberries are under hoops so the shortage seems to be isolated to only a few shippers. One of the defects caused by this rain is "red cell" which is a bursting and breakdown in the individual beads on the berries. The market is slightly higher and quality is just fair. Look for lower numbers available towards the end of the week. Blueberries still have inadequate supplies coming out of Chile and Mexico. Market remains steady while there are the occasional reduced volume prices being offered to help make room for new inventory. Shipping locations include Florida, Texas, Arizona, and California. Quality has been good. Look for markets to ease up as we move into the weekend and the shippers receive more imports. Raspberries will have relatively steady supplies out of Mexico with some temporary shortages caused by the delays in border crossings. The market remains steady with higher undertones as shippers attempt to meet the challenges of bringing the fruit across the U.S. border and into the distribution areas in a timely manner. Quality has been good. California strawberry availability is still in extremely short supply with intermittent rain and overnight cold temperatures bringing plant growth to a standstill. Although we are past the high demand period of the Valentines day pull, shippers are still stripping fruit and waiting in hopes of receiving a string of dry days with adequate temperatures to bring color to the fruit. 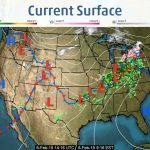 Mother nature is not being cooperative with rain and a series of weather fronts predicted starting Wednesday with more fronts emerging in the near future. Many shippers are anticipating harvest conditions not changing for them until the first of next month. The market is fairly firm even though the holiday demand has subsided. We are still in a demand exceeds supply situation out west with many growers not harvesting at all in the upcoming days leading up to the weekend. Mexico berries are still in steady supply although the peak of the season is just reaching its climax. We expect to see a decline in production as we move forward coming out of that area. Many shippers are urging loading out of Texas as an alternative due to the ever-increasing shortages in West Coast production. The market remains firm with slightly lower undertones as shippers look to continue to move limited numbers of fruit during the post Holiday lull. Florida berries are becoming better in supply as the weather improves and temperatures continue to work in favor of harvesting larger numbers of solid fruit. As with Texas, shippers are encouraging moving customers to this region for loading due to the increasing numbers of available fruit. Look for this region to play a larger role in supplying fruit to customers in the Mid West and Eastern Seaboard as an alternative to the West Coast berry shortages. Markets remain firm with lower undertones as we move past the Holiday pull. The broccoli market has started to pick up with the colder and wet weather we've recently experienced. Weather looks to be cooler the next few days in all areas slowing down the growth process. Look for supplies to slightly decrease going into next week. Quality is good with slight purpling, some mechanical damage, and occasional yellow cast. The Brussels Sprout market has leveled off but still remains tight with supply being affected by the recent rain. The quality has been affected by the rain and cold weather and sizing tend to run smaller due to this recent colder weather. Look for the Brussels Sprout market to remain tight going into next week. The carrot market continues to remain steady. Quality is good, and supplies are adequate to meet current demand. We see no change in the carrot market going into next week. Cauliflower market continues to get stronger as suppliers are battling lower yields. The Yuma weather has been cooler resulting in a slower growth process. Overall, the quality is good with minor bruising and some yellow cast with weights in the 25 to 28-pound level. Look for this market to continue to adjust higher going into next week. The celery market is very active. Demand clearly exceeds supplies and this will continue throughout the month of February, at a minimum. Heavy rains in Oxnard/Santa Maria coupled with cold weather these past few weeks has slowed down the growth and harvesting of this commodity. Supplies in Yuma are very limited as well. Escalated pricing on contracts as well as value added items is in effect. Common defects being reported include insect damage and pith. Muddy boxes, as well as product having excess dirt, has also been reported upon arrivals. Jalapenos- Better supply of Jalapeno than last week available to load in Nogales, AZ from Mexico. Growers continue to harvesting jalapeno out of the Sonora and in Northern/Southern Sinaloa. Quality out of Sonora is Good. Quality out of Sinaloa is good. Mostly medium to large size available from both growing regions. Market on jalapeno has started to decrease and should continue to decrease minimally as we end the week. Jalapenos from Mexico also available to load in McAllen, Texas. Serrano – Better supplies of Serrano peppers available to load in Nogales, from Mexico. Serrano supplies expected to better through the week. Supply on Serrano this week meets demand. The production of serrano is slightly increasing. Price on Serrano pepper is decreasing on a 40lb box and #10lb Pack and is expected to remain steady through the week. Moderate supplies of Serrano also crossing into McAllen, Texas. Tomatillo – Good volume on Husk and Peeled tomatillos are available to load in Nogales, from Mexico. Good supplies on both varieties expected to continue through the week. The tomatillo market is steady. Prices remain steady in the low teens. Quality on both varieties is currently good. Both varieties of tomatillos also available to load in McAllen, TX. The Cilantro market continues to be steady in Yuma and Mexico. The cilantro quality is good and has been affected a bit by the colder weather at the beginning of January. Look for the cilantro market to continue to remain steady going into next week. District 1&2 (Central Valley & Southern California Coastal Region) is coming along nicely and peaking on 75ct/95ct/115ct size to start. Due to the recent weather, the smaller size fruit 140’s and smaller are looking to tighten up for the next couple months. The rain and cold weather brought on the larger fruit and smaller fruit is staying limited on sizing and green on the trees. Current markets are looking steady, normal business on small fruit looks steady for now but could get snug in the next few weeks. This week limes have taken a turn again, volumes are decreasing crossing the border and market is getting active. The market has started creeping up but there is an imbalance in the US selling price and the field prices in Mexico. The market here is not rising fast enough to keep up with the rising field prices due to inventories at the border. In other words, it is costing more to buy the limes in Mexico than the general spot market is willing to pay in the USA. We expect this to drive volumes down as importers and packers have to stop losing and get the market up in order to keep going. There still has been larger sizes available but this is about to change when this last flush of fruit cleans up. The fruit that will be picked going forward will start to shift toward smaller sizes. We expect by the end of February large sizes will see a large premium over smaller sizes Current FOB market prices on 10# are $6 -$8, and the 40# current market prices are $18 - $22 depending on the size. California Navels is starting off the week with light supplies. The Central Valley is starting with rain Tuesday through Friday and the Southern California region is expecting rain Wednesday and Thursday this week. Most of our suppliers are doing their best to pack ahead and get in front of the storms. Markets remain steady and most suppliers are holding off promotable opportunities until they build inventory supplies. Demand remained strong to start February and we expect it to remain strong with the limited industry inventory. Most of the deals being offered are to move MED fruit. The 138ct fancy & choice grades are limited. We encourage orders placed at least 48 hours in advance to help allocate orders. Color and flavor are excellent, brix averages are climbing to 13-14 as we are into some of our best varieties of the season with great quality. The pack has been majority fancy grade with limited choice grade availability. Satsuma Mandarins supplies are ample on any size or pack style. Brix is 12-14 and extremely juicy. Delite Mandarins are coming along peaking on 32/28/24 followed by size 36. Plenty of Pummelos available sizing and quality look great. Cara Caras & Blood are moving along, plenty of supplies available. Import Cucumbers from Honduras are in peak season, the market is a little stronger as less supply is crossing the border from Mexico. For the past two weeks, FOB prices have been low and shippers in Mexico and Honduras slowed shipments to the U.S. dramatically and once supplies were under control shippers were able to push the price back up. Quality is good and should continue that way for some time, most shippers will start to wind down for the season by the end of February, only two will go through March. Moderate supplies of cucumbers being harvested in the Mexican State of Sinaloa this week. Supplies remain light as growers continue to transition among fields. Mostly plain and small sizes available in 1 1/9 bushel pack this week along with 24ct and 36ct pack. Few Super, Select, and large size continue to be packed this week. The cucumber market has increased and stabilized and is expected to remain steady through the remainder of the week. Quality out of Sinaloa is good. Eggplant supply in south Florida is still very low but greater supplies from Mexico have brought pricing down. Supplies are still coming from the southeast and southwest coast off of limited acreage and quality is getting better, some shippers were having problems with scaring issues after high winds in early January. Don't expect any increase in eggplant supply through February from south Florida, the market will be guided by supply crossing from Mexico. Florida shippers are planting late because of wet fields during December and January so expect some delay on spring crops. Eggplant- Good supplies of eggplant continues to be harvested in the Mexican State of Sinaloa. Both fancy and choice grade currently being packed. Current market on eggplant has decreased and is expected to remain low on both grade packs through next week. Quality from Sinaloa on fancy and choice pack is good. Green grape supplies continue to be very limited this week. On the east coast, there has been little to no green grapes available. Maybe 1-2 pallets occasionally. On the west coast, a handful of shippers had a few pallets. Sizes are heavy on the XL to Jumbo range and markets are still very firm. We do not expect to see better availability until later next week if the containers arrive as scheduled. Taking into consideration all the recent issues with late arrivals and delays, I am cautiously optimistic. Quality has been good on the fruit we have been able to secure. We will continue to monitor the volume of fruit arriving and will communicate any improvements. Supplies remain limited and markets are firm. Red grape supplies are slowly starting to improve this week. The industry was expecting more arrivals in the front part of the week, but those vessels were pushed off to later this week. However, by the weekend, we do expect to see better supplies of red grapes on both coasts. Market prices are still holding firm this week but will start to decline rapidly as more containers arrive. We will be watching closely to monitor the volume of red grapes arriving to be ahead of the market shifts. Quality has been reported as strong. Sizes are still very heavy on the XL to Jumbo range, but as more fruit arrives, we expect better availability of the smaller and less expensive sizes. Availability and market shifts are expected by the weekend. The Green Onion market continues to come off slowly with the recent nice weather in Mexico. Currently, the weather has cooperated with a little more supplies coming on. This recent cold weather in January is causing occasional leaf minor and mechanical damage. The green onion market will continue to come off going into next week. The kale market continues to stay strong with the recent rain and cooler weather in Yuma. Quality is fair with full bunches, and only an occasional yellow leaf being reported. A few suppliers have remained steady while others have attempted to take pricing upward. Overall, this market is stronger compared to the previous week. The rains in Yuma have subsided. Common defects from the rain and cool weather include puffiness, misshapen heads, light mildew, and some mechanical issues. The quality, in essence, is average with multiple shippers. Temperatures are expected to be on the cool side in Yuma for the week. The soil temperatures are below the acceptable level of marginal. This means the crops are growing slower than usual. Demand is moderate at best, so all orders are being filled to its entirety. The weights on liner lettuce are averaging 39-43 pounds. Like the previous week, supplies continue to be moderate to good on romaine as well as all leaf items. A few suppliers are lighter in inventories to start the week, Overall, the market is up. Romaine has picked up in demand yet suppliers continue to flex for large volume type orders. Shippers are looking to keep the momentum going on romaine as this market has been flat for so long. Green and red leaf, as well as butter, is a bit stronger with multiple shippers. Common defects being reported to include mechanical, cupping and ribbing. The Tender Leaf market remains steady on spring mix, arugula, baby spinach, and cello spinach. Quality issues are fair with minimal yellowing and bruising of the tender leaves. Look for these items to continue to remain steady going into next week. East Coast- We will see good volume going into next week. Steady supply on 9s,12s and 15 with good demand on all sizes. Although we are currently seeing good availability on cantaloupes, incoming shipments from Guatemala, Honduras, and Costa Rica are still down compared to last year. Suppliers are still facing whitefly issues and it has been an issue since the Fall season. West Coast- Good demand this week on the west. Mostly 12s and 15s on the market with volume deals available. Extremely light offerings on 9s and 18s. Vessels coming from Central America take 2 days to arrive into Florida and about 8 days to arrive in California. East Coast- Very good demand on all sizes with an active market. Quality is fair as we are seeing some quality issues, mostly spotting. Larger fruit (5s and 6s) are extremely limited as suppliers struggle to cover orders. Contract orders are being covered but we will need to welcome the option of subbing into smaller sized fruit. Mostly 8s, 9s and some 10s this coming week. With growers planting less honeydew this year in Central America, and the virus caused by the whitefly, we are seeing fewer shipments from all growing regions. The Whitefly has been a huge setback since the start of the season as they usually arrive in the spring season. With no rain hitting regions like Guatemala in the Fall, the whitefly infestation came on sooner than expected. Affected plants are stunted, have low productivity and the melon itself is unmarketable or salvageable. Growers are reporting that supplies will get extremely tight going into March. West Coast- Honeydews are extremely tight on the west. Contract orders are being covered but having to sub into smaller sizes. We cannot expect any relief any time soon. Fruit will only get tighter going into March. Fruit is hard to come by on the east and even harder on the west as vessels from Central America take up to 8 days to arrive at the port. Growers have planted in the desert and some will harvest as early as April, weather permitting. Light to moderate supplies of watermelon available to load in Nogales, AZ. A moderate volume of watermelon starting to cross through Nogales, AZ this week. Few shippers are receiving watermelon from Jalisco. Market on watermelon being reported as steady to start the week but has started to decrease as better volume is now being harvested. Quality on new crop watermelon is good. Onion market is steady with a slightly weaker undertone on Colossal and Jumbo yellows. This is due to light demand and supplies peaking on the larger sizes. Red onion supply and market are steady with little change in sight. White onion market has peaked with the first of the Mexico onions starting to cross into the U.S. Quality of the storage onions is still very nice with little to no reports of issues upon arrivals. This is the time of the year where Translucent Scales start to show up in these late storage onions. It is important to keep onions in the area with steady temperatures with lots of air blowing on them. Anjou, Bosc and red pears are still being packed with good numbers. Anjous are peaking on 80/90 with good supplies of US#1 with only a few fancy grades. Bosc is peaking 100 and smaller. Markets are fairly steady. Quality overall is good. Current supplies are improving and will continue to get better each week for the next couple of months. Demand on the crownless has increased industry-wide and suppliers are doing their best to keep up with the current demand. Crownless supplies expected to start improving in a couple weeks. Current market prices on all sizes between $10-$12. Potato carton markets has had little change from last week on all sizes. Retail bag demand is light which has shippers making deals to be able to keep the production lines moving. Supplies of large cartons are limited with little change in sight. Quality is good out of most areas with a few issues being reported out of Wisconsin. The main variety out of Idaho is Burbank's with only a few sheds running Norkotah's. Supplies of Norkotah's will dwindle by the end of March. Transportation has good availability but the weather has them moving very slow and are extra heavy due to all the ice and snow build up on their trailers. 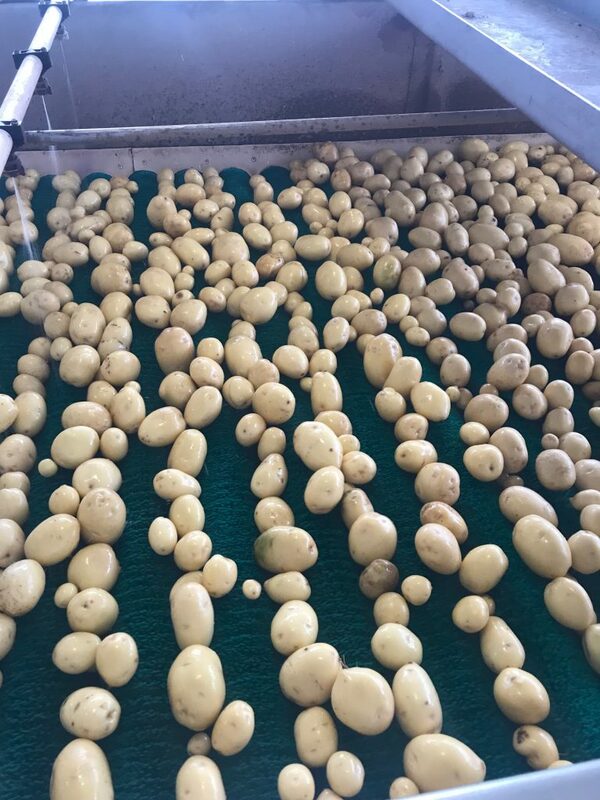 Cool temperatures over the week with highs in the teens could slow the transport of potatoes from the storages. 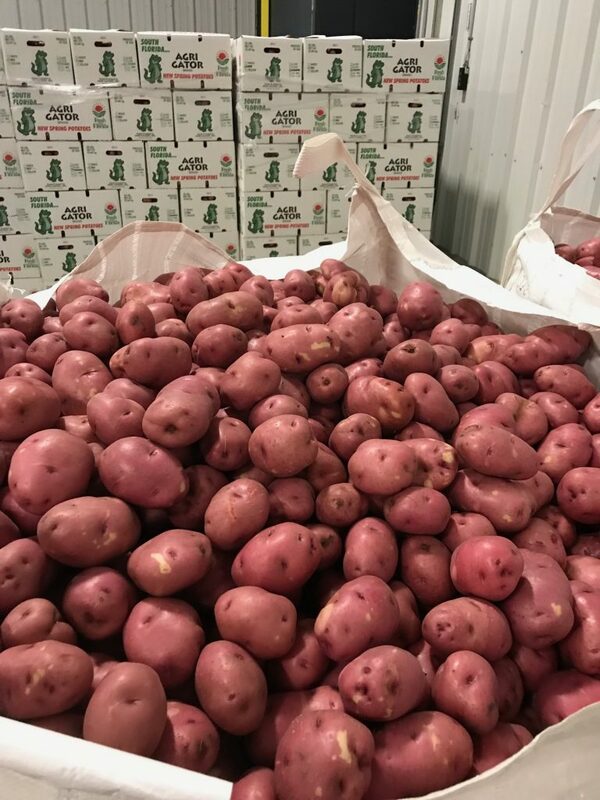 Color potato markets continue steadily from last week with little change in all colors and sizes. Supplies are still being shipped out of Washington, California, Idaho, Wisconsin, Colorado, North Dakota, and Florida new crop. Supplies out of Florida look to be good on all three colors compared to the last 3 years. Quality out of all areas is still good with very few reports of issues upon arrivals. New crop Florida is going with good supplies of all colors. Squash supplies are very good on both colors in the southeast and southwest Florida. Warm sunny weather has turned squash plants on, producing good volume and good quality. Homestead is the primary producer this time of year, with steady supplies also coming from Immokalee. We expect supplies to continue through the weekend much like they have the past week, there may be some interruption later this week with rain and cooler temperatures moving in but that will not last long. Italian and Yellow S/N- Good supplies of Italian squash continue to be available to load in Nogales, AZ this week. Better supplies of Yellow S/N also available to load in Nogales. Price on Italian squash continues to be steady as prices remain low. Market on yellow s/n has decreased and stabilized on both #1 and #2 grade pack . Quality on both packs on Italian is good. Quality on yellow s/n continues to be mostly fair on #2 grade pack to good on #1 grade this week. Supply on Italian squash exceeds demand. Supply on Yellow S/N still meets demand this week. Import stone fruit availability continues to improve. Fruit is available on both east and west coasts. Quality is being reported as very good. All varieties are currently available, but sizes are limited as most of the fruit is on the larger side. On nectarines and peaches, tray packs are running in the 30-40 size and volume fill is in the 50-60 size range. On the plums, both red and black are available, but most fruit is being packed in tray packs. On the volume fill, sizes are in the 50-60 range. Market prices have started to decline gradually. I expect to see another drop next week as more fruit is expected to arrive. Overall tomato volumes have been reduced from rain and cool weather throughout Florida growing regions, however, a full range of sizing is available on rounds as growers harvest through crown, 2nd, and 3rd picks. Roma volumes continue to be light for the season but heavy volumes crossing from Mexico continue to keep Eastern FOBs competitive. Quality is mixed but a fair amount of #2 fruit is available as a result of recent rain and wind. Grape and cherry tomatoes yields are mixed between farms as supply continues to improve this week. A warm weather trend has helped boast grape tomato production bringing fobs to the lowest offerings of the year thus far. Mexico is in full swing production working through Winter crops with steady volumes crossing AZ and TX. Nearly all items are at suspension agreement minimums. There is a good supply of large rounds and plenty of volume spanning all varieties. Roma tomatoes have strengthened by a dollar or so following a series of scattered showers in Mexico while farms rotate. With mostly dry weather conditions in the coming week, markets should continue into February near minimums with healthy supply through both McAllen and Nogales facilities.